As we started to look for churches doing great things in communications, we also realized there are churches who have good ideas, but something—like money—gets in the way from making it happen. First CRC of Grand Haven, Michigan, is one of those churches. The church of about 225 people is becoming well known for environmental outreach in their community. Known as the “Creation Care” church, First CRC looks at recycling as a way to care for people. Through their used appliance ministry, the church collects gently-used appliances and gives them to people who need, but can’t afford them. Last year alone, nearly 200 donated appliances passed though the church to families. That is the First CRC of today. But online, this church is stuck in 1994. That’s when their website was created and it’s been fairly stagnant ever since. This site doesn’t serve their needs. Like many churches, they find themselves stuck in a situation where it costs $80-per-hour to make changes. And even then, there’s no guarantee how timely they’ll be done. First CRC is ready for an update. They want to incorporate their appliance ministry by making it easier to connect with donors and recipients. Plus they want the ability to update announcements, add sermon audio, collect online giving, better connect with their community and more. These changes are something one of our judges really liked. Leaders in the church have met to talk about the changes they want and a new church secretary, who has past experience in maintaining websites, is in place to make it happen. 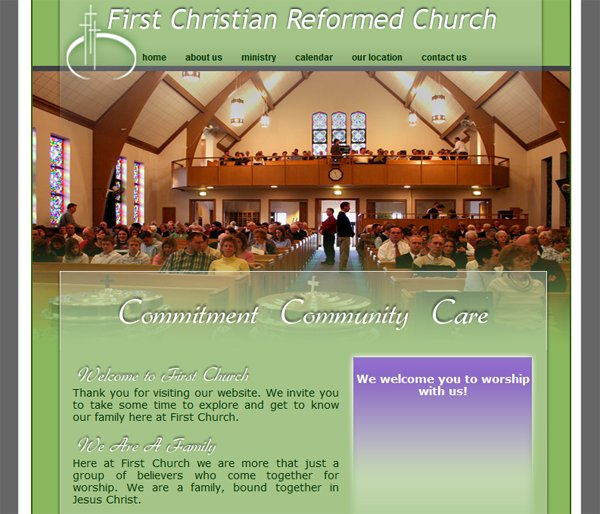 First CRC has found a local web designer they want to work with. This person is not only affordable, but someone they feel they can trust. “Most important, this individual is willing to train current office staff in maintaining and assuring weekly—if not daily—updates as needed,” explains Gustafson. So as First CRC moves forward with a vision to better serve their community and members online, we’re excited to help them ditch the 1990s with this year’s Make It Happen grant.